Charles Unwin is the meticulous clerk for the illustrious detective Travis Sivart, famous for repeatedly foiling the schemes of criminal mastermind Enoch Hoffman. When Unwin unexpectedly finds himself promoted to detective, all he wants is old position back. However, Sivart has gone missing, his supervisor turns up dead, and some of Sivart’s famous cases seem to be solved incorrectly. Unwin sets out to find Sivart, aided by a narcoleptic assistant as well as mysterious Manual of Detection. The Manual of Detection feels like an old “noir” detective story, complete with a mysterious woman walking into the supervisor’s office. It seems Cleopatra Greenwood, occasional accomplice of Enoch Hoffman, has been sleepwalking as well. Unwin is unwitting enlisted to follow her at night, and soon discovers a strange plot involving Hoffman’s sinister carnival and the dreaming populace of the city. Dreams play a large role in the novel, and a surreal atmosphere pervades even in waking scenes. There is a massive number of interconnecting plotlines, but the main threads are easy enough to follow. The smallest details sometimes become important later in the story, and although everything is addressed, some explanations seem a bit glossed over and satisfactory. The ending seems a bit rushed in parts, but everything is wrapped up nicely as Unwin proves a more competent detective than even he believed himself. 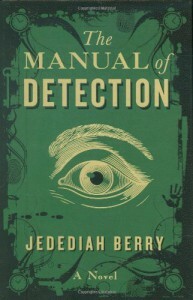 The Manual of Detection is simply a fun read, and provides a traditional mystery mixed with a bit of fantasy. The hardcover is even designed to look like the eponymous Manual, with the title and agency logo embossed directly on the cover.